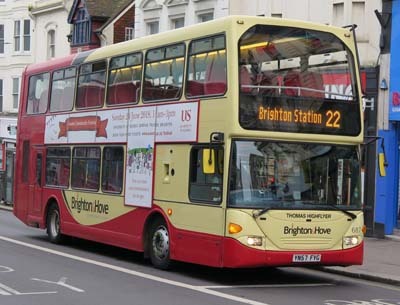 Connections with Brighton and Hove : This bus has been named in honour of a young African boy who was rescued from a slave ship in the nineteenth century and later died in Brighton. Eight-year-old Thomas Highflyer (real name unknown) was rescued from a slave ship off the east coast of Zanzibar, along with two other African boys, by the British anti-slave ship the HMS Highflyer in 1866. He was named after the boat and the man that rescued him, Captain Thomas MS Pasley. When the HMS Highflyer finally docked in Portsmouth in the Autumn of 1868 Tom was sent to Brighton to be educated. He was cared for by the family of a Royal Naval officer and later by the officer's friend, a retired coastguard, and his wife. Tragically, Tom became ill and died of tuberculosis two years after his arrival in England. The bus naming coincided with Brighton & Hove Black History Group's restoration of Tom's grave and a memorial service held for him last week at Brighton's Woodvale Crematorium, where he is buried. 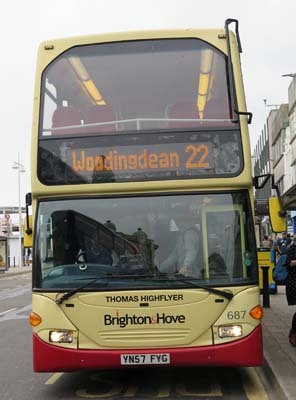 Four children from Tom's old school, St Mark’s Church of England Primary School in Brighton, travelled to the memorial ceremony on board the new Thomas Highflyer bus to pay their respects to him. Co-founder of Brighton & Hove Black History Group, Bert Williams, said Tom died thousands of miles from his birthplace with no record of his real name and a death certificate that said: 'Son of an African: name unknown'. He said it was a sad story but also a story of kindness and the abolition of the slave trade, a trade which Britain was complicit in for scores of years. "Tom might have lost his African family but he possibly found another one here in Brighton," Bert said. "We were instrumental in the slave trade and instrumental in stopping it." Bert, a member of the Windrush Generation, said it was an honour to have a bus named after Tom and exciting for local children to see it. "The kids were beautiful," he said. "They were proud that he went there and he had a love of cricket. They wanted to know the bus number and they were so excited it was going to pick them up." Terrorised, taken from your home. How did it feel to be all alone? Over sea on a sail ship, many, many miles of a trip. And we don’t even know your name. St Mark’s was the school to which you came. Taken on a ship. How were you taken? Over the seas of Brighton. I feel the sea breeze blowing into my skin. I smell raw meat with salt being grinded onto it. I see big buildings. I think I will do great here. Your life may have been short but, my God, you lived it. You were a survivor at aged 8. Kidnapped. With such courage we couldn’t be more proud. I bet you loved your life when you were rescued. I hope you lived the very best life here in Brighton! You are, and will be, very well remembered for eternity. 687 Scania Omnidekka - carried name since June 2018.